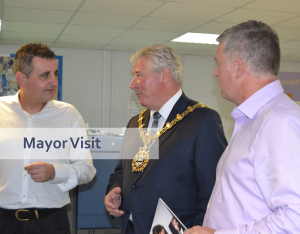 A visit to a growing Blackburn company has left the Mayor of Blackburn with Darwen impressed with their plans for the future. Councillor Alan Cottam visited Ronset’s facilities in Whitebirk to find out more about the innovative printing machines they have invested in to help them become one of the area’s leading printers. Ronset worked closely with Blackburn with Darwen Council to print all of the marketing materials and signage for their presence at the International Festival for Business ‘Made in the UK’ exhibition and conference in Liverpool in July. “Ronset has done incredibly well to come through the recession even stronger than they were before and I am really excited about their plans to further increase the speed of their turnaround for jobs whilst still offering customers a cost effective service.